Although most of my "historical" pirates are by Foundry, I have also started to collect some Black Scorpion figures, even though they are considerably taller than the Foundry ones. Some of this extra height is negated by the fact that the Black Scorpion figures are designed for slotta bases which, on the whole, I don't use. So I cut the bar from the feet and glue them directly onto washers. 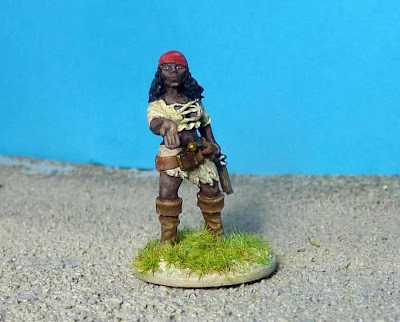 So far I have painted four of these figures, all girly pirates, and started some of the undead pirates for a game with my son, who is a big fan of the Pirates of the Caribbean online game, which even I have been known to play on occasion. I notice that I have three more of these lady (although they all look quite unladylike) pirates on the workbench at present. One is even nearly done so maybe I will give her a bit of attention this week. I bought another four girl pirates today at Salute. These are new and are in the resin that, unfortunately, Black Scorpion has moved to as metal has got so expensive. I didn't notice any price reduction, however, for this "cheaper" material. There is quite a lot of flash on these so they will need some careful work. I might start one this week and see if I can get her caught up with the others I have on the go. 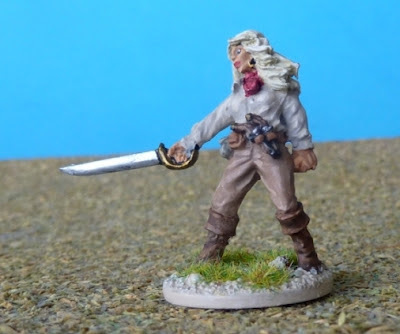 Apart from, possibly, the bottom one of the four I have done, most of the Black Scorpion pirates look like they have escaped from the first pages of a Penthouse pictorial from the eighties or, perhaps, a particular film I saw on a hotel pay channel in a hotel in Canada a year or so ago. Historical they are not. And, as Barry Norman probably never said, why not?